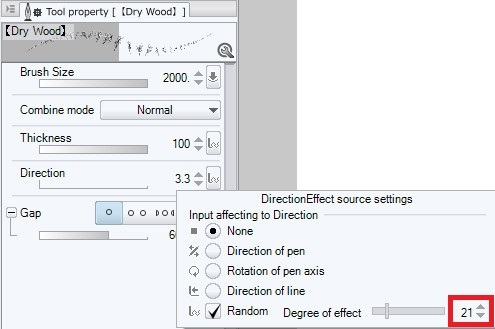 Pattern Brush of Clip Studio Paint have various functions. 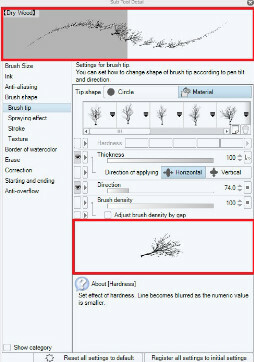 Knowledge of basic operation is essential for mastering brush material. we will share about basic operation based on monochrome drawing. By learning the basics, you can use brush material more effectively. What is a Brush Materials? frequently appearing accessories and more with just stamps and stroke. it can create complicated picture in a surprisingly short time. 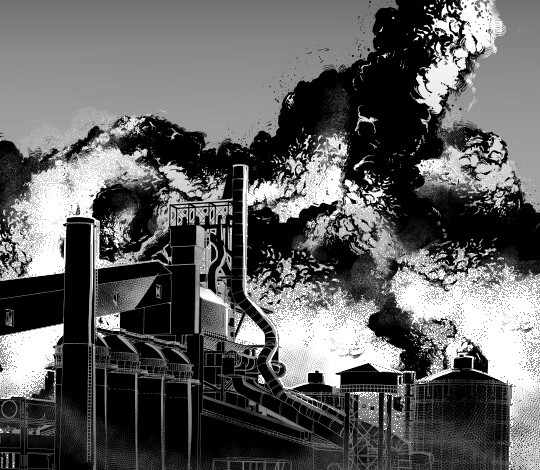 Black smoke that drawn with strokes only. 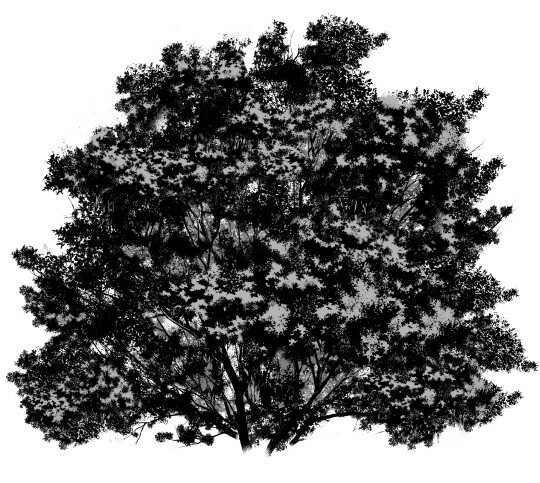 Tree that drawn with combination of 3 differents brushes. 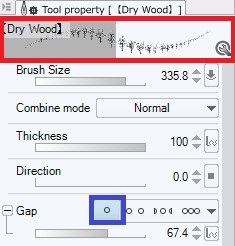 to display the pattern brush tool property.  ※ The size’s number that using here are millimeter (not pixel). and the sub tool detail screen as shown below will be display. Click the left blank space (inside the blue frame) to display the eye mark. Then setting item will add into the tool property. Basic preparation is now complete. First of all, we will set the size as basic preparation. 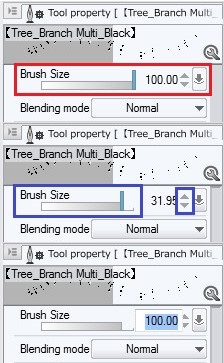 Change the brush size as shown as in the red frame below. or shift left or right in the bar (big blue frame). Or by enter the desired number of size. 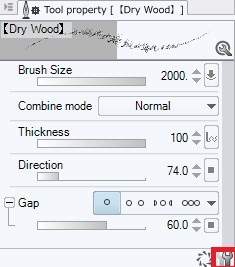 open Brush Size Effect Source Setting. Check the pen pressure inside the blue frame and adjust the minimum value. from 80% to 100% with pen pressure. Adjust inside of the green frame when fine setting of pen pressure is required. 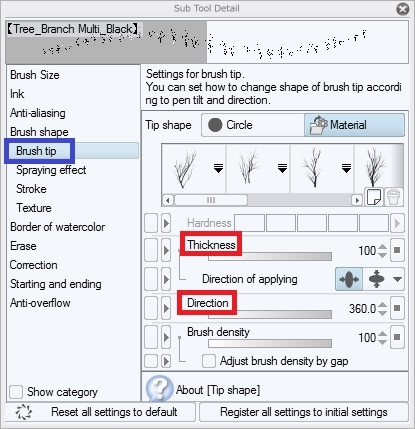 Then continue draw with brush by using this setting. 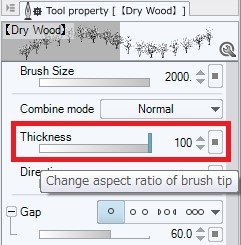 Example, set the brush size to 100 and the minimum value to 0. 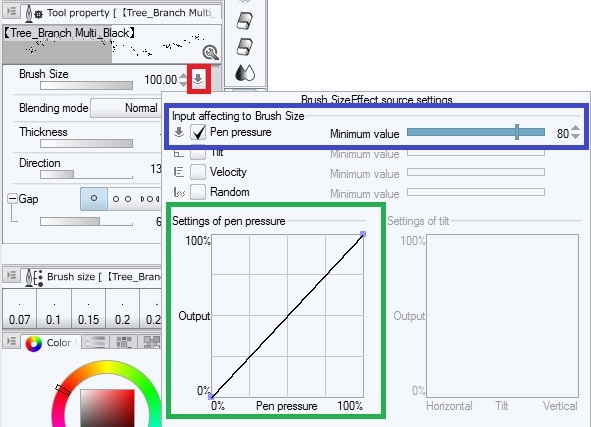 Draw stroke by increasing the pen pressure from left to right. In this way, the object got a perspective view with only one stroke. 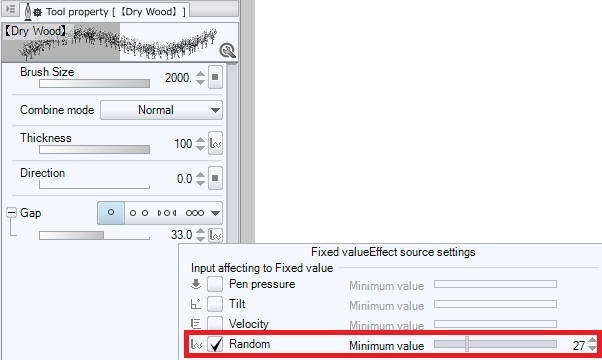 Next, select random and set any minimum value. It will changes randomly to various sizes automatically. random settings are effective for objects that do not need a perspective position. 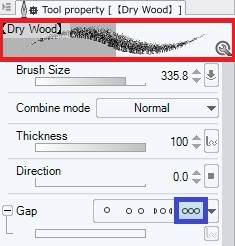 it will be possible to increase variations when using brush materials. The gap setting is shown as below. The mark in the blue frame towards to the right, the higher the density of gap. You can see the preview in red frame is changing. 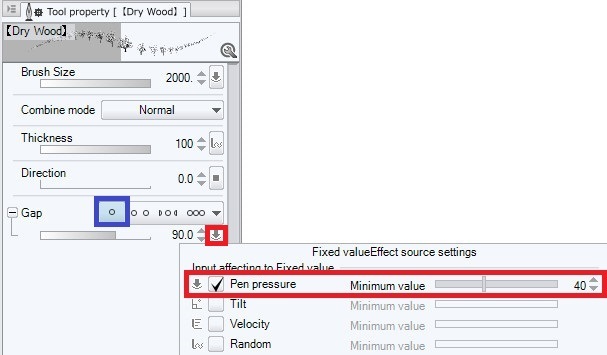 The setting of the numerical value can be done only when the fixed mark of the left end (the blue frame on the left) is selected. The lower the number, the narrower the gap; the higher the number, the wider the gap. Select the gap fixed mark (blue frame), click the mark in the small red frame (next to the size number) to display the fixed value effect source setting. the gaps changed under the influence of pen pressure. If the function of the gap is too dense like this, you can adjust unnatural objects. On the other hand, it is an effective and fast tool for dense object. The thickness setting will be shown as below. By changing the thickness, variation of the object shape appears. we will customize the thickness setting. Here is the explanation for easily customize random size. Click the mark inside the red frame, select the random and set the minimum value with any value. 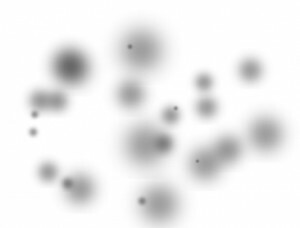 In the setting shown above, the thickness is randomly drawn between 30% and 100%. Objects of various thickness were automatically rendered with one stroke. customization of the thickness can change shape in a very effective function to prevent pattern unification. 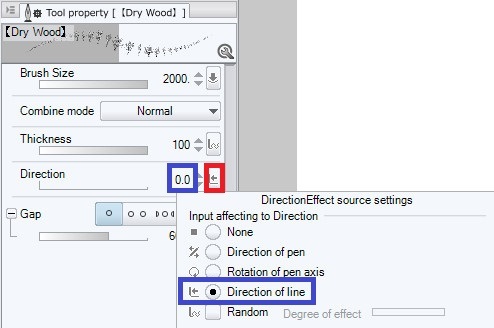 The direction setting is done from the items in the figure below. By changing the value you can see that the preview in the red frame is rotating. 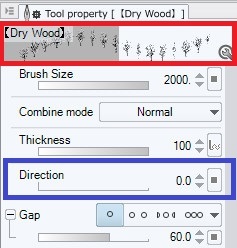 To check the preview in large size, click the spanner mark in the lower right corner of the tool property. 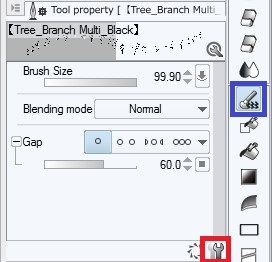 You can check the direction of the brush from the sub tool details screen. Customize direction makes material can be used more conveniently. In this section, we will focus only on item that are easy to customize. Set the direction number to 0 and click the mark in the red frame to select the direction of the line. The direction of the object changed with the red arrow stroke. Next, change the direction of the object to 90 degrees. Next, check the most versatile random check. The higher the numerical value of the Degree of effect, the higher the turning degree. 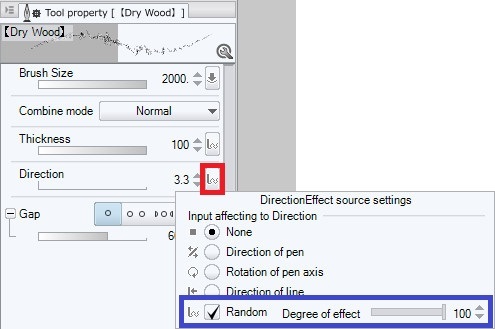 To lower the degree of rotation, lower the Degree of effect. The range of the slope has become smaller. You can change the same object shape by tilting. 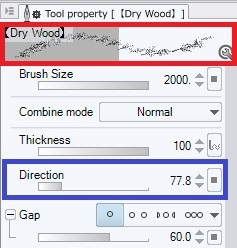 Direction customization is a very practical function to prevent pattern unification as well as size, spacing, thickness.By using these functions you can make brush material more useful. Please try using it by all means.